Creative Listening Center programs use Dynamic Listening Systems™, Brain Gym®, and Acutonics® to help children and adults improve auditory functioning, leading to better communication (both receptive and expressive), improved focus and attention, and easier learning. We see children, teens and adults with various forms of learning challenges. A large percentage of these individuals have an auditory processing problem. One of the difficulties is that most interventions do not address the auditory problem, and many of the interventions rely on the auditory system for information input. 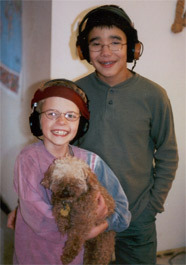 Dynamic Listening Systems improves the ability of the ear to receive accurate sound information. With Brain Gym, we use movement to change stress-related learning to restore instinctive learning patterns. Of children diagnosed with a “learning disability” about 70 percent have an auditory processing problem. The speed of auditory processing is critical to success in learning and communication. With Dynamic Listening Systems, we re-educate the ear-brain to improve listening and information processing. Brain Gym movements integrate body and mind to enhance the ability to learn. Do you know why so many children are having attention problems? The answer is not a simple one. Attention problems can be caused by an auditory processing disorder, anxiety, a learning disability, a food or chemical sensitivity, or even giftedness. Using Dynamic Listening Systems to regulate the vestibular system and desensitize hyper bone conduction allows improved focus and attention. Brain Gym movement provides energizing activities to overcome learning challenges and move toward whole-brain integration. Do you still have the capacity to hear pitch and music as you once did? The Tomatis Effect recognizes that the voice can only reproduce a sound the ear can hear. We help musicians tune up their ears and enhance their performance. Many adults have used our programs to improve memory, communication skills, and creativity.